On December 9th 2007, a curious event took place at the University of South Carolina football stadium. As 29,000 people filed inside, each was given a piece of paper bearing four names and phone numbers. During the event, each person called those names and asked them to vote for Obama in the coming primary election. Those 29,000 attendees called over 35,000 voters in the space of ten minutes – enough for the Guinness Book of Records to certify the event as the ‘largest phone bank‘ in history – and all for very little cost to the Obama campaign. The record only stood for a few months, because on August 27th 2008, a line of people six miles long – over 80,000, all told – waited for seats at Invesco Field in Denver. They were there for Obama’s acceptance speech as the Democratic nominee for the election, but once again, they were going to be called upon to help out the campaign with more phone calls. These events were replicated hundreds of times across the country, and some were focused more directly on making calls. I recall hearing about one in which the speaker walked the attendees through how to make their very first phone call to a voter. Yes, you might be nervous, he said, but I’ll show you how to do it – and he then proceeded to make a live call through the loudspeakers. Suitably encouraged, the thousands of attendees made their own phone calls – and why not, since everyone sitting next to them was making a call. 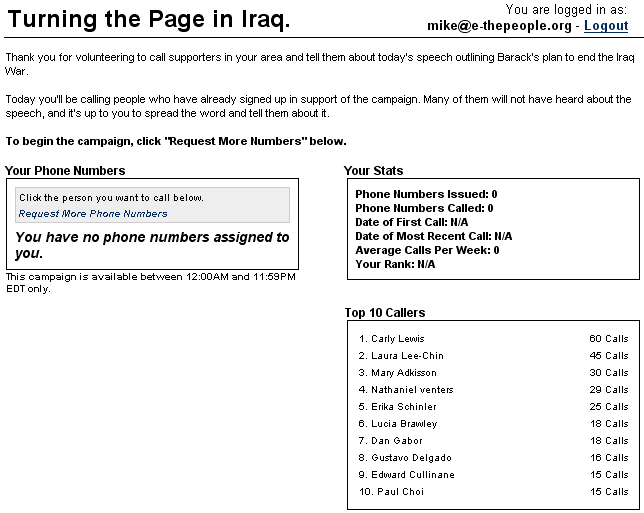 Naturally, there was an Obama ’08 iPhone app, which provided news updates to half a million users and (of course) encouraged users to make phone calls to votes. Over 50,000 calls were made, a figure that doesn’t include calls made by people who used an iPod Touch, and whose calls couldn’t be tracked. The campaign had a single, clear goal: get Obama elected as President of the United States. Accomplishing this goal would require gaining a majority of the delegate votes in the Democratic Presidential Primaries in over fifty states and regions; each of those states had different rules for selecting their delegates, some of them quite unusual and rather game-like. With the Primaries won, the campaign had to win the general election. 3 million donors made a total of 6.5 million donations online adding up to more than $500 million. Of those 6.5 million donations, 6 million were in increments of $100 or less. The average online donation was $80, and the average Obama donor gave more than once. 70,000 campaign supporters used their MyBO fundraising pages to raised $30 million from friends and family; donation meters, leaderboards, targets, goals, rewards, and achievements – all of these most powerful reward and tracking mechanism, ripped straight from game design, were applied to the business of winning the most important and most serious game of 2008: winning the US election. Note: This post was written before Jane McGonigal’s talk was published online by TED, so it doesn’t deal specifically with it. However, I do address the talk in a comment. It’s becoming commonplace to read that games can cure cancer, eliminate poverty, repair the climate, fix our government – and in short, save the world. By layering game mechanics like experience points, levels, achievements, and missions onto the real world, we can motivate, train, and reward everyone in the world to make the world a better place. These games – known as persuasive games, serious games, and alternate reality games – have been around for several years now, but have recently come to prominence with the increasing popularity of online games, as well as notable speeches by game designers such as Jane McGonigal and Jesse Schell. The claimed power and reach of these games have been used to make some very big statements about using these games to tackle some even bigger problems. World Without Oil (2007) asked players to imagine what would happen if an oil crisis happened – what would they do, how would they cope and respond, how would the world change? The game received massive worldwide coverage and is commonly cited as a good example about how to get people to think and imagine about serious issues. The game had 2176 registered players over 32 weeks. Of those, only 276 were active (i.e. submitted at least one piece of content); 170 players submitted more than one piece. Superstruct (2008) was “the world’s first massively multiplayer forecasting game.” Players would help “chronicle the world of 2019, imagine how we might solve the problems we’ll face,” and invent “new ways to organize the human race and augment our collective human potential.” The game had 8901 registered players; it’s hard to tell how many of them were active, but 554 ‘superstructures’ were created. Signtific (2009) “is a public laboratory for developing and sharing cutting edge ideas about the future of science and technology. We invite scientists, engineers, designers, developers, researchers, technologists, and creative thinkers of all kinds to join the lab and help us uncover, together, what is impossible to uncover alone.” The game had 1764 registered players, and as far as I can tell from the leaderboard, only 250 were active. Many online games and ARGs measure their success, at least in part, by the number of unique users and pageviews, but with only a few hundred active players, I don’t think these games did a great job in convincing people to participate. Games such as World Without Oil may have made an impact on the behaviour of the hundreds of thousands of people who visited their sites (e.g. becoming more energy-efficient), but it’s hard to tell. Urgent Evoke (2010) “is a ten-week crash course in changing the world,” with a goal to “help empower young people all over the world, and especially young people in Africa, to come up with creative solutions to our most urgent social problems.” The game currently has over 8000 players registered and 3000 pieces of content submitted in only one week. What’s more, the game is truly international, succeeding in its goal to attract players in Africa. Urgent Evoke is shaping up to be the most popular game of its type by far, which is a testament to its message and marketing power. At the rate it’s growing, it could have up to tens of thousands of players by the time it’s finished. A big reason why Evoke is popular is because of its simple and attractive Obama-like promise: “You can become a superhero. You can change the world.” The first mission asks you to write about yourself – what will you be doing in 10 years time? There’s evidence that visualising your hopes and ambitions can you achieve them, in a sub-‘The Secret’ kind of way, so I actually think this first mission is a good idea. I also think that by creating a social network amongst its players, Urgent Evoke can create connections between strangers and help spread new ideas, which is very admirable and could pay dividends in the future (which you would hope, for a game that costs half a million dollars). On the whole, though, Urgent Evoke – and the rest of these projects – appear to be more like networked creative writing exercises than games that improve the world in a direct, measurable way. Perhaps they’ve some people have changed their behaviour as a result of playing, but it doesn’t seem like a whole lot. I find games like World Without Oil and Urgent Evoke very interesting, because I like the idea of people writing about the future; you don’t know what you think until you’ve said it out loud, or better yet, written it down. In a way, these games help people think things through, which can only be a good thing. I also give a lot of credit to them for inspiring people, particularly younger people who spend a lot of time online (even if the player numbers need a lot of improvement). Unfortunately, while inspiration is necessary, it’s not enough to ‘save the world’, and it’s not correct to claim that it can. As a former research scientist, I remember how fun it was to come up with new questions and experiments – and how hard and tedious it was to spend weeks and months repeating experiments late at night in the lab, running gels, centrifuging samples, becoming frustrating at balky equipment, and being disheartened when my results were inconclusive. At the end of the day, you need to do a lot of work to make even the smallest discovery. There was an interesting survey on the Cosmic Variance blog recently, asking What got you interested in science? Books about science (both fiction and non-fiction) were the top two choices – more than parents/friends/relatives or teachers. Why? I think it’s because there’s such a variety of books out there. I have no doubt that in the future, we’ll see plenty of new games and activities that motivate and inspire people in new ways, but the fact is that different things will motivate different people. Given that there is no single good way of inspiring people, it’s useful to have a variety of ways, and the beauty of books is that there’s a real variety of them, much more than games or movies which require so much time and resources to develop. Over time, there’ll be more games, and perhaps we can programme games to match that variety, but that will require a different set of tools and understanding of what games are. Games can inspire people, but that means they can change the world no more – and no less – than stories or books or movies or TV shows. ‘Step one – write problem in a search engine, see if somebody else has solved it already. Step two – write problem in my blog; study the commentory cross-linked to other guys. Step three – write my problem in Twitter in a hundred and forty characters. See if I can get it that small. See if it gets retweeted. Step four – open source the problem; supply some instructables to get me as far as I’ve been able to get, see if the community takes it any further. Step five – start a Ning social network about my problem, name the network after my problem, see if anybody accumulates around my problem. Step six – make a video of my problem. Youtube my video, see if it spreads virally, see if any media convergence accumulates around my problem. Step seven – create a design fiction that pretends that my problem has already been solved. Create some gadget or application or product that has some relevance to my problem and see if anybody builds it. Step eight – exacerbate or intensify my problem with a work of interventionist tactical media. You could say this is unfair, since the atemporal Feynman has inspired other people to work on the problem. The question is, are those other people solving the problem? How would we even know if they’re solving the problem? How do you verify their work in a reliable manner? What if they start gaming the system? The Democratic Party and the Obama campaign won the game – they got Obama elected, one of the biggest achievements there is. Was there a big change in politics, in the way things are done in Washington? Some people say yes, other people say no. Did Obama’s election save the world? Clearly not; it hasn’t even saved the US. While major financial disaster may have been averted, the new healthcare bill hasn’t yet been passed (although I’m optimistic). Millions of people are unhappy with the massive bailout given to the banks, doing anything about climate change is still incredibly difficult, corporations can now buy ads to influence elections, and there’s the small matter of two wars going on. All of these problems are incredibly important – probably more important than the election. So where did all the Obama campaign volunteers go? Why aren’t they still making calls and knocking on doors in their millions? It’s because they’re tired, they’re uninspired, and they don’t feel they can make a difference any more. During the election, there was a clear message: Elect me, and together, we will change the world. There was also a clear method: if you show up and vote, and you donate money, and you drive people to the polls, and you persuade other people to vote for me, etc., and finally you add up all the votes, we will win. Simple as that. Today, not only is the message unclear, because Democrats disagree on policy details (public option, bipartisanship, Guantanamo, tax, bailouts, protectionism, Afganistan, etc. ), but the execution is also much muddier and less direct. Want to get the healthcare bill passed? Call your congressman – never mind the fact that he probably won’t listen! The beauty of Obama’s “Change” slogan was that it was something that everyone other than Republicans could agree on. But “save the world” is even better; everyone, even Republicans, can agree that saving the world would be a good thing. The problem is that when you start getting more specific – as Obama has done – two things happen: people start arguing, and they also get bored. Let’s get bored, first. There are many instances of massive numbers of volunteers coming together online to do large quantities of hard and tedious work. The open source community is one example; the 150,000 volunteers of Galaxy Zoo are another. I don’t think either of those communities believe that they are ‘saving the world’, but they are doing lasting and valuable work that benefits all of humanity. Unfortunately, writing Linux and classifying tens of millions of galaxies both happen to be quite boring, so they don’t get much attention. On a simpler scale, donating money to buy mosquito nets or to loaning money to microcredit foundations are both good activities that also don’t get the heart racing. Galaxy Zoo is interesting, because its creators have made an experience (I hesitate to call it a game, even though it could easily be converted into one) that has an isomorphic structure to the problem of classifying galaxies; the experience is also designed to work better than machine vision. Suffice to say that it is not easy to do this; often you end up wasting your volunteers’ time by getting them to do something that could be done by machines faster and better, or you don’t understand the problem sufficiently to create an isomorphic experience than non-experts can participate in (e.g. curing cancer). Bored yet? Let’s have an argument, then. Here’s one: do you think climate change is a serious problem? In the UK, 30% of people think that it’s exaggerated. Imagine you think it’s serious: should we reduce energy consumption, increase energy efficiency, or develop cleaner sources of power? How much money should we give to each venture? Will you join my game to save the world by donating money to create more nuclear power plants? Many of those who are against abortion or homosexual marriage feels that by protesting against them, sometimes violently, they are saving the world. I’m pretty certain that many Israelis and Palestinians both feel that their armed struggle is also fighting against each other both feel that they’re ultimately trying to save the world. For the liberal-minded and progressives among us who use technology, it’s pleasant to think that we’d be the only ones smart enough to use a game to save the world, but saving the world is like the Golden Rule – it sounds like a good idea, but it doesn’t actually work in practice because we don’t actually agree on what’s best for each other. Just imagine what will happen when everyone uses games for their own causes. It hardly needs saying, but games are a tool that can be used for the most pure and most evil of purposes. McGonigal makes the controversial argument that if people played more online games like Urgent Evoke or World of Warcraft, our society would be better equipped to battle big problems. People spend a collective 3 billion hours per week playing online games today, she said. That number must be 21 billion — seven times the current amount — for our society to realize its innovative and creative potential, she said. That’s because gamers are trained to believe they can win, and because they’re matched with tasks that are fit to their skill levels, based on what level they’ve achieved in the game, she said. McGonigal wants to see people exhibit the same level of enthusiasm and optimism they display in games in their real lives. I don’t understand the reasoning behind the 3 billion and 21 billion hours remark; surely playing Farmville or grinding away in World of Warcraft is not the same as doing hard work? Yes, there are some tasks that demand real skill and concentration, such as running a major corporation in Eve Online or a guild in World of Warcraft, and I totally believe that these people could spend their time doing something ‘useful’ instead, but these people are a real minority – perhaps under 1% of all active MMO players and under 0.1% of all online gamers. People play games for different reasons, and a common one is relaxation and down-time. It’s just not credible to me that the 80 million people who play Farmville, two minutes here and five minutes there, would happily spend their time outside picking vegetables instead – at the very least, you would need a type of technology that simply does not exist yet, and when it does exist, Farmville will be even more fun and diverting. As for the enthusiasm and optimism that people display in games, I’m afraid that a swift session of Modern Warfare 2 on Xbox Live, or perhaps 10 minutes of clicking squares in Farmville, would rapidly provide some counterexamples. Not to say that games can’t make people happy, but let’s just not pretend that it’s all sweetness and light online. Jesse Schell recently gave a talk at DICE 2010 imagining a future in which game mechanics are infused in every part of our world. You’ll get points for brushing your teeth, reading books, watching TV adverts, mowing the lawn – you get the idea. There have already been plenty of criticisms made of the talk, but what really depressed me was Schell’s suggestion that because all of your activities and achievements would be recorded permanently, you might stop worrying about points and change your behaviour to avoid your grandkids seeing that your 500th book was some trashy chick-lit novel. That’s his insight? That instead of becoming a better person because you want to get lots of points, you’ll become a better person because other people might be judging everything you do? I’m not sure what’s worse, myself; the former seems empty, and the latter seems pathetic. I feel that Schell’s talk suggested a horrific lack of self-examination on the part of pretty much everyone in this supposed future. What is it that people want? Why do you want to mow your lawn? Why do you want to read a book? How many people even ask these questions of themselves any more? Rewarding points isn’t going to make the answers come any faster. In all of this talk of serious games and persuasive games, it’s worth pointing out that many of the things I’ve discussed here aren’t games in any formal sense, but tracking and reward mechanisms that encourage certain types of behaviour. These behaviours can be general or specific, but from the examples that I’ve seen, the more specific they are, the more likely they are to deliver concrete results. As far as games like World Without Oil and Urgent Evoke go, I think that the best we can expect is for them to help and inspire people to achieve great things, just as a good book or teacher might; the problem is, it is very difficult to track their effectiveness because we can’t know what those great things might end up being, and we can’t agree on what to measure. Is it by ideas generated? Points earned, connections made, dollars donated, papers published? A good comparison is the scientific enterprise. The interesting thing about scientists is that they aren’t particularly motivated by money – instead, they’re motivated by recognition. But not any type of recognition, such as millions of TV viewers (scientists and academics are often looked upon dubiously if they get too popular) – no, they want the recognition of their peers, both those alive today and those in the future. And so the structure of science begins to look like it could be isomorphic with a game structure that awards points based on the number of papers you publish, the amount they get cited, and the impact factors of the journals they go in. Unfortunately, this already sort-of happens in academia and no-one particularly likes it, since it’s not always apparent after a year or even a decade which papers are important, which results have been faked, and whether it’s right that journals like Nature should matter more than others. Then there are the scientists who believe that teaching is just as important as research – and those that disagree with them. What is clear is despite the fact that the scientific process is slow and hard and tedious, and that many scientists aren’t paid a lot or given any recognition or reward, they still insist on working for years. It might help that they get a pay rise and some recognition and reward, but that’s not the point – there is obviously some internal motivation that drives them on (and of course this applies to more people than scientists, I just mention them because I know them). Children who feel that they have to be compliant to the extent of partially denying or repressing their true natures are bound to remain dependent on external sources for the maintenance of self-esteem. Such a child will develop into an adult who will continue to feel that he has to be successful, or good, or approved of by everyone, if he is to retain any sense of his own value. This necessarily makes him especially vulnerable to the reverses in life which we all have to endure: to failure in an examination or in competition for a job; to rejection by an actual or potential lover; to bereavement or to any other form of loss. Such unpleasant events make all of us temporarily resentful or low-spirited or both; but, in the case of those who possess little or no built-in self-esteem, may precipate a devastating plunge into the hell of severe depression. The way to cope with reverses in life is by developing resilience against the caprices of the world; to determine and internally maintain a steady direction and sense of worth, and to remember past successes and recognition. Yet I fear that the games we are designing, focused on real-time things that other people have decided to measure and reward – will undermine rather than build that resilience. You can design a game that encourages resilience, although it wouldn’t work for everyone, and books and movies might work better for some people. You can design a game to encourage people to save energy, which we know can work – if people care about saving energy or climate change. You can even try designing a game that will cure cancer – assuming you know enough about molecular biology to create an experience that is isomorphic to the problem, otherwise you’re actually inspiring people to cure cancer, which isn’t the same thing. But can you design a game that will save the world? No. The question is meaningless. It is people who save the world, each in their own way, through perspiration as well as inspiration. It is not always fun. You hold out teachers and books as successful examples of what educates and inspires people to go on and do great things. Yes, but. The problem with books and teachers is, it’s very difficult to track their effectiveness because we can’t know what those great things they inspire might end up being, and we can’t agree on what to measure. Should we judge books and teachers by ideas generated? Points earned, connections made, dollars donated, papers published? –I’m just quoting your words back to you, with a question: If we don’t track these effects for books, teachers, documentary films, etc., why must games that have a similar aim and approach perform to this higher standard? What I commonly find is that people have “participation confusion.” Books, teachers and films have readily identified participants (readers, students, audience) and likewise games like World of Warcraft have players. It’s all simple. Whereas games like World Without Oil are not so simple. There are layers and layers of participation. Saying the WWO players were the people who contributed is like saying the Super Bowl is only 22 guys big. WWO had a mess of people on the field, another mess half on and half off, a crowd on the sidelines and in the bleachers, more in the upper tiers, others watching on the telly, still others following by radio… I realize you realize this, because you say “it may have had an impact on hundreds of thousands of people,” but… there’s that measurement imperative of yours again. Well, I just had a woman in Ethiopia tell me that she really admired my work. Actually, I admire hers more. We were chatting because we met while playing EVOKE. So I appreciate your ponderings on all this, and letting air out of Jesse Schell and other overinflated balloons, but meanwhile, in unquantifiable yet very real ways, others of us are saving the world one game at a time. Thanks for the comment Ken. I would be quite happy to change the title to ‘Can games save the world’, since my argument isn’t about whether a single game could save the world – it’s about whether you can make that claim of any genre at all. The reason why I hold games to a higher standard in terms of effectiveness is because they claim a higher standard themselves; you don’t see authors or directors claiming that ‘books’ or ‘films’ save the world. If they did make that claim, I’d be interested to see whether they could prove it; as it happens, people are trying to track the effectiveness of teachers now, but even that’s fraught with problems. As for the participation confusion, you make a good point, and it’s one that I make myself when explaining ARGs to marketing or advertising companies. The difference here is that those marketers and advertisers understand that the effect of an ARG on someone passing through the site for 10 seconds is really quite low, whereas when we say that a serious ARG has had hundreds of thousands of visitors, it can seem like it’s really affected them – which we just can’t know. There was a UK TV series called Jamie’s School Dinners, airing in 2005, in which the chef Jamie Oliver went to a school to improve the quality of meals there. He faced a lot of problems and opposition, but in the end managed to make a difference in their meals and those of nearby schools. Over 5 million people spent at least 15 minutes watching the show. Perhaps some of those viewers changed their behaviour; perhaps they didn’t. The show producers didn’t dwell on that question, and instead began a movement to pressure the government to increase funding for school meals. After a lot of work, the government promised an extra few hundred million, which was a great achievement. Unfortunately it’s still not clear whether the money has reached the schools and is making any real difference. The point is that Jamie Oliver has not claimed to be changing the world, even though he probably deserves to more than others – this is despite the fact that he had 5 million participants, who have spent, in aggregate, a massive amount of time watching and reading about his show, and he effected genuine political change. He knows the power – and limitations – of TV, and how hard it is to really change just a single thing – better school dinners – for a million kids. So, it’s great that you’ve been talking with a woman in Ethopia as a result of Evoke – connecting strangers from different backgrounds and countries is something that games like Evoke do well, and it reminds me of similar conversations I’ve had at conferences and on mailing lists and forums over the years. The conversation is a good thing – but is it right to say that it’s saving the world? Hey Adrian, a bit late to the game, wanted to clarify the CNN article you quoted, just by saying, the context is clearer in the full TED talk. I’m not saying 21 hours of playing today’s games will save the world, I’m talking about a combination of entertainment games that build up key super-empowered hopeful individual (SEHI) skills and abilities and action-oriented or problem-solving games that put them to good use. I have to put a statement somewhere on the Internet asking people to never take “quotations” from the media as a true indiciation of my POV. ^_^ usually there is a ton of context and nuance missing!! 3. I am on a plane. ^-^ Yay Virgin America Wireless! Now where is my “I’m on a plane” game??? Pingback: Vers des ARGs politiques ? « Fais-Moi Jouer ! Thanks for the comments Jane, and now that the video is online I’ve taken the opportunity to watch it. It seemed to me that you were saying people play games because they represent a perfect escape from a broken and not very fun world; and by playing games, people gain skills and learn to appreciate things such as collaboration, optimism, blissful productivity, and epic meaning. By harnessing these powerful skills and values, we can create games that can help solve massive problems. The issue is that I don’t recognise your description of games (or gamers) as being true. I don’t think that people play games purely as an escape from the world (although it’s certainly true in some cases). You say that gamers never get frustrated, never get angry, or depressed – but that’s just not true. Most games aren’t multiplayer or social, and those that are don’t always generate collaborative skills. It’s not true that we genuinely feel productive when we play games – after I spent 20 hours playing Puzzle Quest, I just felt vaguely guilty (and irritated by the crap ending). Finally, I’m not sure exactly what epic meaning is (would be good to hear you expand on that) but I feel that’s a pretty rare experience as well. Not to say that these things aren’t desirable; personally I would love to play a game like what you described, and I’d heartily support anyone trying to make such a game. But from what I know, to suggest that this is the essence of what 500 million people have spent 10,000 hours on is just plain wrong. It’d be like saying that the billions of people who’ve spent trillions of hours spent watching TV have all been watching great TV like The Wire or Mad Men, and are now experts in social interaction and reading emotions, etc. Well, it’s not just my idea of what games are like; as my book details, which is a better explanation of my ideas than an 18 minute talk, these aren’t just random descriptions of gameplay that I’ve made up, and this is not just my own analysis, this proposal for what to do with games next is based on more than a decade’s worth of all kinds of scientific studies and surveys of gamers, gamer emotions, etc. I’m not saying every hour spent playing any computer of videogame is a good hour of gaming, but what I say is certainly an accurate description of the essential possibilities of the medium that have been successfully achieved by the top games of our times. I’m also proud to say that in the 3 days that my talk has been online, I have received more than 1100 emails from gamers who do agree with this description of what games are and what we feel when we play them. And frankly, even if the gamers who feel that way only represent 1% of all gamers, that still means as many as 5 million people who can find new ways to tackle real problems and do more good and be more engaged with the real challenges of the next century. So I really don’t need everyone to agree with me. I’d frankly be happy with just 1 in 500 people, that would still mean 1 million people ready to join forces to be more engaged in raising global quality of life and solving our most urgent problems. And I have no doubt that 1 million people together could change the world. We could argue day in and day out about philosophies of games and what they’re capable of, but the fact of the matter is I am now getting daily reports from teachers on the ground in sub-Saharan Africa about how their gamer students are now spending their weekends working with local community organizations on issues like hunger, poverty, and disease because they are so motivated by and engaged with the EVOKE game. And so at the end of the day I am seeing these ideas work to produce real change. We are at the very beginning of discovering these possibilities and it is awesome. It is great that Evoke is motivating students in sub-Saharan Africa – I really mean that. It’s a positive result and I respect anyone who makes a game that aims to do good. I’m not surprised you received over 1100 emails in response to your talk – it’s very inspiring and it has a uplifting message for games – but as you just pointed out, the gaming population is likely to be much more heterogenous than what was made out during your (short, yes) talk. And it may be a lot lower than 500 million. Of course, 1 million people together could change the world – you don’t need 500 million. If someone makes a game that brings those people together to affect real, physical, lasting change on the ground, then I will be there. On its own, that doesn’t matter at all, but now we’re going to see the ‘500 million’ and ‘3 billion hours’ etc figures everywhere – which aren’t helpful to anyone, because at the very least they set extremely unrealistic expectations. Well, yeah ^_^ I am making a big, bold, claim and doing so largely to counteract the unbelievable prejudice against, and general ignorance about, games and gamers worked up by the mainstream media over the past decade. I could list hundreds of games that don’t create the kind of engagement that our BEST games create. I’m not blind to that. And I’m not naive. But we need more people out there championing the best of games, not the worst of games. The more attention we pay to the best, and the possibilities, the more game developers who will work to create that kind of best-case scenario engagement, the more gamers who will seek it, the more parents who will support their kids in getting it. I am going to be that unabashed champion and no we don’t have 3 billion best case scenario game hours yet, but we can get there over the next decade. Adrian, I’m not familiar with your Jamie Oliver example, “Jamie’s School Dinners,” but no matter, let’s consider it as you describe it. It’s a great cause and a good result, but as you say, it doesn’t (and would never) claim that it is saving the world. The reasons for that are many, but (channeling Clay Shirky) I would say the prime one is that a TV show does little to lower the cost for people to interact and act on the issue. People watch TV in isolation. What did happen in this case is that somebody (Jamie Oliver and the show’s producers) aggregated these isolated acts and leveraged that aggregation (essentially the threat that they could mobilize these individuals) to achieve change. So that’s good but nothing we haven’t seen before. Now let’s look at EVOKE. There is something entirely different going on with EVOKE. People are not playing it in isolation; interacting and acting on its issues are in the game’s DNA. In Clay Shirky lingo, the cost for people to interact and act on issues has plunged to zero (and as Clay points out, when that happens, the world changes). So that’s why I mentioned meeting Ida Benedetto, the woman in Ethiopia, and set it out as an example of saving the world. It’s not remarkable that people with like interests find each other on the Internet. The remarkable thing is the ease in which it happened because of the EVOKE game. It took no effort – the connection essentially made itself. And that IS something the world hasn’t seen until recently. So now let’s talk – real talk – about saving the world. The traditional way in which that happens is by interactions among governments, and I do hold out hope for that. But it seems they could use some sort of push from below, does it not? So for example if there were some kind of massively collaborative democratic action on the issues. Which could only work if the cost for participating was zero – or less than zero; if it were actually fun to participate. So that’s the world-saving thing: massively collaborative socially relevant games like EVOKE and World Without Oil do more than just reduce the cost of interaction and action to zero: they go past zero into the positive. And yep, it’s a game-changer, so to speak. As Jane says, “games saving the world” is a big bold claim, designed in part to get us over old assumptions about games. Jane focuses on the potential in the gamer community, whereas I focus more on experiences that non-gamers feel comfortable engaging in. We have plenty of both kinds of players in EVOKE, as we did in World Without Oil. We both see the underlying economic dynamic as I’ve just explained it. Plus we both have felt the heat – the raw player energy – that comes off these games in palpable waves. Thanks for the links to the Metafilter discussion. I’ll get to it one of these days – but right now, I’m having fun playing EVOKE and envisioning the games to follow. There are plenty of similar comments I could find around the web. Now, I know that many of the thousands of people playing Evoke do find it fun, and I’m sure you could get a lot of testamonials to that fact. But surely if it was really that fun to participate, and the cost of interaction and action was so slow, you’d be getting the same sort of player numbers that other online games would get? If Evoke or WWO got the same numbers as a game like Cafe Society or Mafia Wars or FarmVille – or even the more successful games on Miniclip or Kongregate – then you wouldn’t need to convince me of anything, because it’d be clear that people really were there and it was fun; but I don’t see that yet (and this is all still more of a technical thing and not the point of my article). Jane: Good luck, and I wish you well! 🙂 I too want to make games that do good, and I also champion games wherever I can – but I think we do it in different ways. I’m optimistic – I’m just not *that* optimistic. I like some of these games like molleindustria’s oiligrachy. I’m afraid that most of these kind of games require developer to consult with experts or risking to serve a false fact. It is easier to make philosophy-moral games 😉 . I just have to say Adrian that is a ridiculous comment to make. If EVOKE were ‘fun’, wouldn’t it get as many players as Farmville? The point is not to compare games like EVOKE to all games. The point is to compare EVOKE to other community organizing, mobilizing, online learning, etc. options. We have roughly 14K players in 20 days. That is extraordinary for a startup community. let me try a similar argument. If my blog were ‘interesting’ I would have as many readers as John Grisham. Except I don’t. I have about 10,000 readers. So clearly, I am not ‘interesting’ because I don’t have as many readers as John Grisham. This has devolved into a completely absurd discussion. No game is fun unless it has blockbuster status. EVOKE is *harder* than most games because it asks you to do stuff for real. It will be a decade or more before more people get used to that. But before social media, most people didn’t participate in websites, they read them. Social games like EVOKE can change who participates in the world. I will meet you at the pub of your choice 10 years from now to revisit this conversation, Adrian! If game developers have failed miserably to achieve anything with social games, drinks are on me. If social games are making a difference in the world, drinks are on you. Fair warning: I’m planning to get champagne. Hey Adrian! You and I are in (near) agreement! That’s great! And more to the point, I think I now see where you’re coming from: the additional requirement you have for games is that they be fun. That is something that we don’t ask of movies, books, documentaries, graphic novels etc. They don’t have to be fun. Now, seems to me all I have been hearing from the games industry, for at least a decade, is that they wish games would “grow up.” That they would move past their self-obsession with fun and move (like movies and books) into the larger realm of MEANINGFUL. Good news! They are! And although not perfect, they’re already showing some pretty amazing results! Hundreds of thousands of people are starting to take notice, tens of thousands of people are participating! Of course, there are people who are hanging back; late adopters I suppose. I totally applaud the intention of a future-thinking game like EVOKE, and it’s that intention – whether successful or not – that makes it interesting and meaningful more than its success in attracting mass play. In fact, I wonder if the ambition of scale is sometimes self-defeating. You can mobilise a gigantic army of volunteers around a simple clear call-to-action – get people to vote for the inspirational Obama – but more complex action might be better effected by more local and specific activity, repeated cellular play that adds up to scale rather than all scored together. Totally agree that – The point is to compare EVOKE to other community organizing, mobilizing, online learning, etc. options. – but disagree that you can justify via the numbers, comparisons of different events are invidious. I’m presuming that a lot of activity like the inspirational classes in sub-Saharan Africa rely on the motivating abilities of a local facilitator, like the class teacher, given the focus of an adventure/challenge. Which is a brilliant way to do it, and there’s a lesson about using traditional recruitment networks and skills for participation. But how does the traditional facilitated and focused participation structure best mesh with the open game metric that everyone can join? And if you must go on saving the world… 😉 – I do think real-world game/play has a better chance than most other cultural activities – and therefore greater responsibility – in fostering positive real-world engagement. A meta-formula that I like very much has the dimensions of emotional resilience – aka the happiness you can have control over – as agency plus relatedness plus competence plus reflection. Active participation in any kind of social play does really well on the first three at least, and that’s the kind of feedback that beats any metric. But that’s not just games: I’m sitting writing this in the cafe of BAC where an 8-y-o is rapping in the awesome beatbox academy they run here. What can games do that other social play can’t? It’s how they can harness fragmented and distributed play towards a common goal, across place and time. Still, I struggle to grasp how the 21 billion hours of epic win in a mono-focus 360-feedbacked world like WoW can translate into similar potential real-world engagement. Even theoretically. Isn’t it the flattened focus of that world that grinds out that all-consuming engagement? Reality is broken, yes: it’s myriad-focus, many different games of life all competing for our attention with different stakes for different people. Real-world change is difficult, otherwise it would have happened already. It has to happen with the 499 out of 500 as well, those who are only human as well as the SEHI. Cap doffed to the ambitious intent of these games so far. But how do we progress and make them (even) more effective? More from me. I suddenly wondered if there is a difference in critical culture between the US and the UK. Years ago in the middle of my PhD, my supervisor wrote me a reference to help get me a place on a summer school at UC Davis in Cognitive Neuroscience. She showed me; it was to my eyes embarrassingly glowing. She told me not to worry, I wasn’t that good, but that if she wrote any less than that, the American system would assume I was worthless. This is fascinating and my inner nerd is drooling. In ’03 I wrote my Masters thesis not on videogames saving the world, but on an equally grand claim about videogames changing human communication as significantly as the printing press did. I was studying in a heavily Marshall-McLuhan program, so I was looking at videogames through the “the medium is the message” lens. It’s not that about a game being fun, it’s about a deeper intrinsic reward. Are you familiar with Csikszentmihalyi’s “flow” theory? This is where my gaming research led me. It goes a long way toward separating games from other more passive media like books, film, and television, because the “flow” state relies, in part, on a physical response. It also suggests that what you take away from a flow activity is an increase in the order of the self. I believe that would, in turn, suggest that designers don’t need to build “saving the world” into the game’s content. It may be the case that gamers who achieve flow are more inclined to feel as though they CAN save the world (through problem-solving), and if the content already has them harnessed to a pro-social agenda, then hooray. There’s a concern about relying on sedentary activities to reach this optimal mental state (although evidence that Wii sports games help old people stay physical is helpful). It’s worth noting that piano playing and painting can also produce a flow state for some individuals, and no one worries about a pianist sitting at a piano too long. My current work here in Ethiopia is happening very much independent of any game activity. I am not representative of the gamers that Jane often talks about. I got back into games recently thanks to a class with Nick Fortugno. I played digital games when I was younger, but then I discovered punk rock and didn’t spend so much time in front of the computer. My social and economic justice work is the matured outgrowth of teenage angst thanks to activist circles that overlap with the punk scene. Games, like other forms of media and creative expression, ultimately influence and facilitate by creating opportunities to “shape and explore our values,” to quote a recent blog post from Ian Bogost. This is what I understand of activities like imagining the future that World Without Oil and Urgent Evoke hinge upon. We define and test our values by projecting them onto a yet undefined space of possibility. By helping us define and test our values, games can play a roll in facilitating social and economic justice (that’s at least what I’m think of when we talk about saving the world). I commend Ken, Jane, and Adrian for producing games that harness this power in the hope of creating positive real world outcomes. Like Adrian, I’m waiting for some way to measure the success of these efforts. Did whatever game help people go beyond thinking about problems to addressing them? There’s a huge gap there that would need to be traversed if this assertion is to be proven true, that games can save the world. Urgent Evoke ends with a group of winners who will get practical and material support for carrying out their plans to have a positive impact on the world. It will be interesting to see how their projects work out when it comes time to implement. Urgent Evoke will clearly have made their projects possible, but will it help make their projects successful? Jane – Will these reports of sub-Sahara students’ activities as motivated by Urgent Evoke be published or aggregated anywhere? Are their contributions on the Urgent Evoke network? Maybe I just don’t spend enough time in the game to find these contributions. Chipping in, and good to meet you, if this is how it happens. Moved to comment on how you specify saving the world, for it’s good to talk about such ridiculous things over Easter. Defining and testing our own values is massive, if it motivates us to believe and to act and to spread those values, and if indeed those beliefs and actions are even a small step towards a world-saving good. Of course, almost nothing to say that a game or any other participation tool that helps us do this necessarily makes those values good, it can only amplify and reflect the values and intentions that players, makers (and sponsors, crucially) bring to the fold. Almost nothing but this: I think that there is an inherent good in the politics of form of a game like this, where potentially – if not always in documented practice – like-minded strangers across the world connect through play and discover their own agency and relatedness and a collective super-competence (borrowing some terms from positive psychology, although the last also reminds me of Vygotsky’s ZOPD). These future-imagining games – World Without Oil, Superstruct, Evoke – also help define that space of possibility by challenging players to come up with ideas that fill that space. This still seems a difficult step for people to take – looking not at the numbers who are registered for Evoke, say, but at the percentage who have gone beyond that first step – but this ‘pyramid of engagement’ is a common phenomenon for any online participation activity, take Wikipedia for instance. So I wonder whether the foundation should be online engagement for real efficacy. It’s of course critical how these future-changing ideas get tested and implemented into the real world. There are always going to be obstacles to change (otherwise the future would have happened already) whether those be economic policies, individual human nature, pack psychology, national self-interest, etc and I’d like to see those obstacles more embodied in the play of these games somehow. They might then be (even) more fun to play. Brilliant if Evoke’s sponsors are going to be supporting the implementation of the best ideas. Although it’s not just their responsibility. Another quality that these games – although very like very many other participation activities – is the investment and ownership that players take in ideas that they have made. There’s nothing like it for motivation. Another way that play might save the world is how ideas are spread. I was involved in making with Coney a game-event for the Dana Centre here in the UK based on household waste management and the barriers that stopped people implementing the 3 R’s of Reduce, Reuse, Recycle, called The Rubbish Game. I am making no claims for this saving the world (we couldn’t even save the website). It played twice to around a hundred people a time for a couple of hours. But it quickly got people devising and then playing strategies to put the 3 R’s into practice amongst a bunch of other fun things to do immediately. We had professional independent evaluation following a small percentage of players before during and after the event and what surprised us was that a good proportion of those afterwards said that the game had not only changed their own recycling practice but also had them motivated to change the behaviour of family and friends. I think that’s a result of ownership, and that’s a result of agency in making ideas through play. I’m slightly less convinced by the account by Herodotus cited in Jane’s TED talk of the Lydians ignoring their hunger through a dice-game before using it to decide which half of the population would cut and run. A bit like – humour alert, J – everyone ignoring famine by playing Farmville before the top players get shipped off to colonise Mars. Is that the world-save we want? OK, bit of championing of games and play (I far prefer the latter term). All the same, it’s a no-brainer to recognise that there are very many established practices of facilitating participation and engagement with the world that are neither games nor play. But interesting to note the affordances of play, online and in real-world gatherings, what they share, how they augment, and what they can learn from everything else . But now it’s time to make some food. Hello again all – I’ve been standing back a little bit so that the conversation can go on without me, but I think it’s time to jump back in! First off, I am setting up a dedicated public forum where we can discuss these topics in greater detail. It’s clear that there’s a lot of diverse interest in the potential of serious games like WWO and Evoke, and I’d love to continue this discussion in a better place than my blog post’s comments! Watch this space (or email me if you want to be notified). rosedragon: I agree that Oiligarchy is a great game that really demonstrates how games can uniquely show the outcomes of certain types of systems (in this case, the oil industry). I suspect the reason why it works so well is because it sets the player a very clear goal with very clear options – and in that it mimics traditional gameplay. The question then becomes, how easy would it be to translate this sort of game into other areas, including the real world, and what would it mean for society? Jane and Ken: I certainly don’t think that games have to be popular in order to be fun, and I think a problem here is the definition of ‘fun’. Fun is a very broad term, obviously, and no-one would put game like Evoke into the same category of action-gaming fun as Mario. I have seen Evoke described as being ‘like homework’ by quite a few people, because it requires a lot of creative writing and assignments. Is this a bad thing? Not necessarily: can’t these things be fun? I guess that depends on what kind of person you are. I certainly had ‘fun’ when I was doing an especially interesting homework assignment. In another sense, it’s a bit like reading a historical novel like Wolf Hall – I’m not sure whether I had *fun* reading it (at least according to Raph Koster’s strict definition of mastering a system), but I found it immensely satisfying and fascinating. I can imagine that people completing missions in Evoke having the same sense of satisfaction; and obviously that leaves aside the very unique things where you collaborate together, etc. But the reason why I quoted ARGN’s opinion on the matter is because, as ARG players, I was surprised that they didn’t find it fun. For me, whether Evoke et al is described as being ‘fun’ or not has little bearing on its worth or success, except for how that impacts on its ability to attract new players – and I really *do* think that these games could be easier and more ‘fun’ (in a more traditional games sense) for people to get involved. That’s not just in terms of the missions, feedback, points, learning curve, but the whole sign-up process and viewing missions and so on. I can get more specific if you want, but that’s what it really comes down to. So at the end of the day, I make these criticisms because I hope they can be helpful to anyone who is thinking about making these sorts of games. Tassos: The idea behind emotional resilience and how you could develop that through a game is really very interesting – hopefully someone will do that soon! Susy: Can you be ‘in the zone’ in Farmville? I would say it’s the opposite – I’m usually ‘zoned out’ while clicking my farm squares for the 200th time, and I know that other players like it for precisely that reason – there is really no challenge to the ‘game’, and it’s more like an ultra-easy hobby. The problem with equating problem-solving in games to problem-solving in the real world is that games typically have incredibly specialised and often simplified problems; I can see how that might make players think that ‘anything is possible’ but really, most games are *not* designed to develop people’s problem-solving skills (even the so-called Brain Trainers). Ida: Thank you for joining the discussion! I agree that one of the most salient outcomes of games like WWO has been the imagined futures, challenges and solutions. This is not a completely new thing – people have been ‘war gaming’ scenarios for a long time – but the internet allows us to do it on a much wider and richer scale. But at the end of the day, we do need to evaluate the success of these games in their stated objectives (making a positive impact in the world) versus other projects of similar budgets. I think the best way to save the world is tying all religion together and explaining how the universe works and why we are here. I really like Ida’s statement about how these games work: “We define and test our values by projecting them onto a yet undefined space of possibility. By helping us define and test our values, games can play a role in facilitating social and economic justice.” I would add that I think the “space of possibility” is an evocative one: for some people, the most evocative they have ever found. One observer deemed WWO as an ‘effective narrative device to get people to voice their operating mythologies’ (I’m paraphrasing). Cool. And Ida: Yet. I haven’t written you back *yet*. I been busy!